Denali State Park is a 325,240-acre (131,620 ha) state park in the U.S. state of Alaska. It is located in the Matanuska-Susitna Borough  adjacent to the east side of Denali National Park and Preserve, along the Parks Highway. The park is undeveloped wilderness with the exception of the two day-use areas, three campgrounds, and two trailheads accessible from the Parks Highway. Denali State Park is home to many different terrains, animals, plants, and opportunities to safely and respectfully enjoy these parts of a natural wild environment. The Denali State Park wilderness draws many different types of visitors for many different reasons. It gives many opportunities to explore for backpackers, campers, canoers, families, fishermen, kayakers, rock climbers, and just people driving through. Mount Denali is one of the main attractions, and there are easy-to-reach lookout points for visitors driving through. Sometimes, though, it is hard to view the peak due to clouds and other weather issues. Denali, however, is not the only peak one can view, and its surrounding range is not the only place for exploration. The Talkeetna Mountains to the east also offer different levels of climbing and backpacking experiences. Divided by a large valley, there are many different views of Alaska looking in either direction. The tundra on the surrounding plateau of the ranges and in the park offer a unique environment for plants and animals. This terrain also offers lots of small lakes which are easy to hike to and visit. Following regularly used trails will allow visitors to view many of the park's natural beauties during their trip. Rivers in the area allow for clearwater canoeing and rapids for various levels of canoers and kayakers. This area is also known for its salmon fishing during season. Since the environment is still very rugged and uninhabited it is left virtually wild, and using proper camping and environmental practices keeps the park clean for the next visitor to see it as wild as it should be. Different seasons strike the area. During summer, there are almost 21 hours of constant daylight every day, with the sun barely dropping behind the horizon. The summer temperature is in the 80s and lower, making for nice conditions to view many attractions. During winter, the sun stays hidden most of the day and can get down to -40 degrees Fahrenheit, with snow covering most of the land. During all of the seasons the surrounding glaciers in the area can be visited, and their distinct runoff paths can be seen. The flora and fauna in the park comprise a very diverse habitat. The plants and animals are part of the ecosystem in the area and should be respected by visitors to the park. Animals visitors may see include black and grizzly bears, beavers, deer, elk, moose, and smaller ground mammals. Certain seasons attract insects, like mosquitos, so visitors should be prepared. Many unique bird species exist in the park, including certain water birds. For example, loons, ospreys, and trumpeter swans are attracted to the park's many lakes and streams. Fishing the clear streams also provides the opportunity to see many different types of fish; for example, these streams spawn all five species of Pacific salmon. The tundra is also home to many unique plant species which are able to survive the winter and summer without dying, and along waterways many different trees and plants can be found. ^ "Denali National Park and Preserve - Aviation Reporting Coordinates (U.S. National Park Service)". National Park Service, Department of the Interior. ^ The Milepost (61st ed.). p. 406. ISBN 978-1892-15426-2. ^ a b c "Denali State Park". State of Alaska > Natural Resources > Division of Parks and Outdoor Recreation > Department of Natural Resources. p. 1. Retrieved March 21, 2016. ^ "Denali State Park". State of Alaska > Natural Resources > Division of Parks and Outdoor Recreation > Department of Natural Resources. pp. 1–2. Retrieved March 21, 2016. ^ a b "Denali National Park and Preserve - Aviation Reporting Coordinates (U.S. National Park Service)". National Park Service, Department of the Interior. p. 3. ^ Waits, I (May 19, 2015). "Denali State Park Hiking". Denali Guidebook. p. 4. Retrieved March 21, 2016. 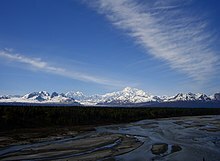 Wikimedia Commons has media related to Denali State Park. Denali National Park and Preserve; National Park Service, U.S. Department of the Interior (April 2006). Denali National Park and Preserve, Final South Denali Implementation Plan and Environmental Impact Statement (PDF). Denali Park, Alaska. p. 9. Retrieved March 21, 2016. This article about a location in the Matanuska-Susitna Borough, Alaska is a stub. You can help Wikipedia by expanding it. This article related to a protected area in Alaska is a stub. You can help Wikipedia by expanding it.